It is sad to say goodbye to July for once we are in to August the feeling that Winter is only around the corner is depressing, still I have plenty of tatting projects to look forward to over the next few months. As you can see Renulek 2014 doily has really grabbed my attention and I am staying up late at night to get more done. This is not a very good picture because the sun was too bright, but I hope you can see that after the grey the thread is cream and the outer boarder is an off-white. There are still many more rounds to complete and of course I am going to introduce the colour grey back again before it is finished. I am never quite sure what to call these mats, should they be doilies? A doily to me is a pretty piece of paper that you put underneath a cake. Of course you can do this with many the tatted mats but some of them are far too big for that purpose. The translation on Renulek's blog usually says napkin, which again is very different from how I would class a napkin. So I am calling them tatted mats. Renulek has over the years designed some wonderful mats and in 2014 I went quite crazy and began at least four, so in the last few days have picked up one of them to continue with, as you can see I have just started adding the cream the grey was tatted three years ago. 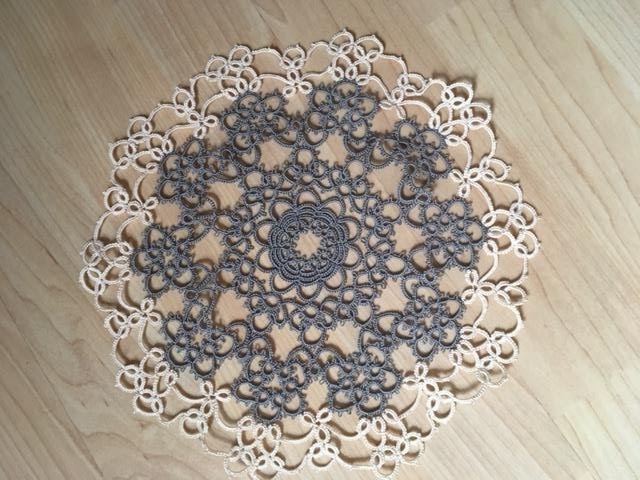 Because my time is very limited at the moment to get any craft work done, especially tatting, I find this a good way of being able to pick a piece up and continue with it during the odd spare moment. However, my biggest fear is that when the project becomes larger I will loose interest, we will see! If you travel to another country and you know there are some tatting folks that live there, well you try your best to see them. 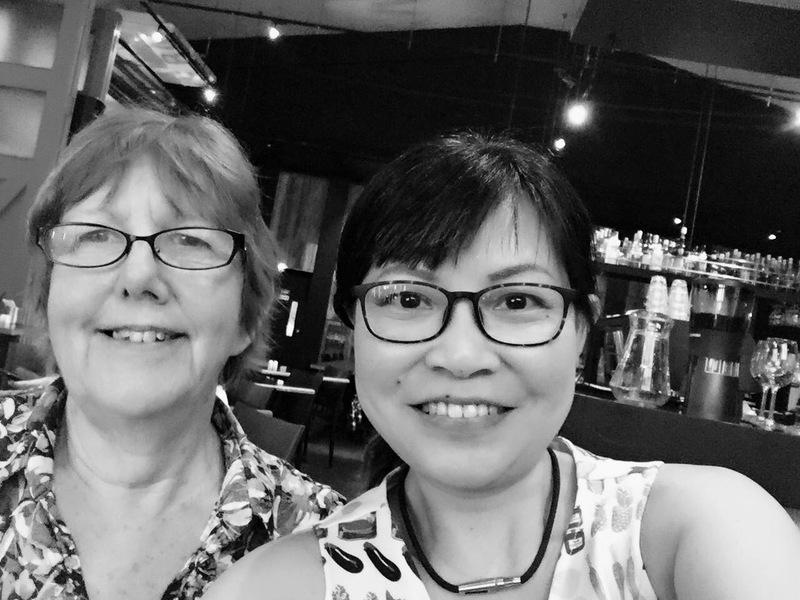 Every time I visit Singapore I meet up with Val, her blog is here, although she admits she has got behind with her blogging! This selfie was taken in an old redundant fire station in Singapore which has been turned into a restaurant. This is quite unique for Singapore because wherever you look there are so many modern high rise buildings. Even with some clever modification the restaurant managed to remind me of home. 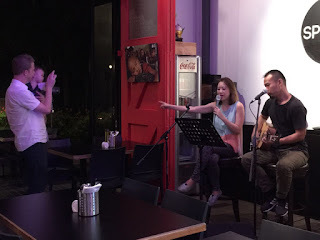 My daughter-in-law was singing there and we had taken her baby son (my grandson) of just 7 months to watch. You can just see the original red fire station door in the picture. After signing for a delivery today I noted that it is 7.7.17 which is so cool! However, it is not so cool weather wise because we are in the middle of a heat wave in the UK, but that is fine with me. Also I am trying to recover from the Art Exhibition that was held in one of our churches over the last three days, it actually took another three days to set up, so pleased it is now over. Amongst, mostly works of art to hang on the wall, there were other items on display such as 'Im in the Garage' wooden creations and some of my tatting. So I have pleasure in announcing that both the tatted mats that I displayed were sold and this is one of them, only just finished on time. I am really pleased that it has been sold, rather than putting it away in a box, although I might have found a home for it especially as it fitted quite well on this table. 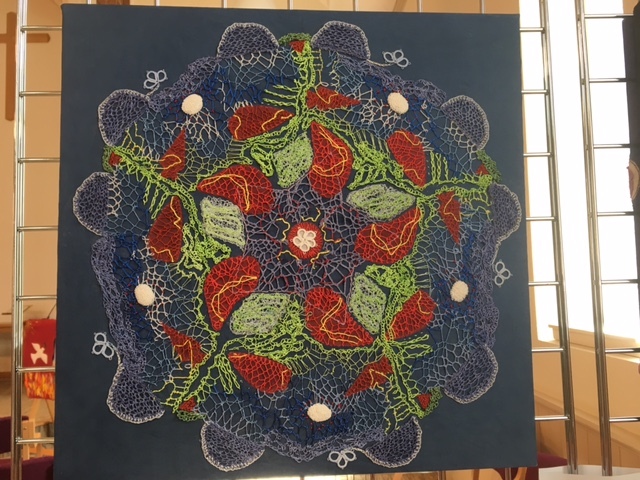 The Women's Institute participated in a Wellcome Trust-funded project, to create textile art representing the health related research that takes place at Diamond. In collaboration with The Oxford Trust and Diamond, the WI created 30 panels that depict diseases such as HIV, Alzheimer’s, and breast cancer, as well as iconic scientific images such as diffraction patterns, a DNA fingerprint, and even a synchrotron. Under the guidance of leading textile artist, Anne Griffiths, over 1000 scientists and members of the WI contributed to the art project, making Designs for Life one of the largest science and art fusion projects ever to have taken place in the UK. I visited this mobile exhibition 'Designs for Life' in the nearby town of Romsey last week and one of the panels that immediately stood out was this one, it represents 'Foot and Mouth' which is a very infectious disease that effects cattle and has caused many a farmer to loose his livelihood. You can just about see a piece of tatting in the middle and some bits around the side, the only panel to have any. I am finding it difficult to blog at the moment due mainly to an Art Exhibition which is to be held this coming week. Hope to catch up with my own tatting soon.